The U.S. Environmental Protection Agency is moving forward with its previously announced plan to remediate the Sherwin-Williams/Hilliard’s Creek Superfund site in separate, staggered phases. EPA officials estimate they won’t be able finalize a cleanup plan for Kirkwood Lake in Voorhees until 2019. That timeline keeps Kirkwood Lake as the last portion of the Sherwin-Williams/Hilliard’s Creek site where the EPA will determine an official remediation method. On Sept. 26, the EPA reaffirmed its decision to remediate the superfund site in separate phases when it released its most recent cleanup decision for an area of the superfund site known as the Route 561 Dump Site in Gibbsboro. As with the rest of the site, the Route 561 Dump Site was contaminated with lead and arsenic over multiple decades by a former paint manufacturing plant that was operated in Gibbsboro by John Lucas & Company and later Sherwin-Williams from the mid-1800s through 1977. Under the EPA’s plan, 23,000 cubic yards of contaminated soil will be removed from portions of the Dump Site and backfilled with clean soil, and a cap consisting of soil cover in vegetated areas or asphalt on portions of commercial properties will be installed in parts of the site as well. The EPA expects Sherwin-Williams will conduct and pay for the cleanup of the Route 561 Dump site. Remediation of the site is expected to cost approximately $14 million. With a plan for the Dump Site now finalized, the EPA next estimates to have a plan finalized in 2017 for a burn site in Gibbsboro, a plan finalized in 2018 for the former manufacturing plant and then finally a plan in 2019 for the Hilliard’s Creek and Kirkwood Lake waterways. Over the past few years, the EPA has maintained that areas of the superfund site that are upstream, such as the Dump Site, Burn Site and paint plant, must be handled first else it could risk possible re-contamination of downstream areas such as Hilliard’s Creek and Kirkwood Lake. “As a general approach, the remedy selection and implementation process will focus on portions of sites that contain a higher level of contaminants located up-gradient while continuing investigations of down-gradient areas,” states the decision document released by the EPA on Sept. 26. 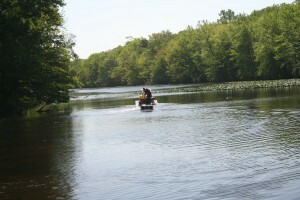 That position puts the EPA at odds with Camden County, which owns Kirkwood Lake. Officials with the county worry that if the entire superfund site is not remediated at the same time, then Kirkwood Lake may not survive until 2019 and beyond when the EPA announces a cleanup decision and work begins in the following decade. In April, county officials outlined the findings of a report from an environmental and civil engineering firm commissioned by the county to determine the health of Kirkwood Lake. According to that report, the lake has been getting progressively shallower over the last century, leading to a diminished carrying capacity and an ever-increasing danger of rainstorms washing lead and arsenic sediments in the lake downstream to the Cooper River. The lake’s original depth was reported around nine-and-a-half feet, but that number had decreased to four-and-a-half feet by 1979 and then decreased again to about two to two-and-a-half feet in recent years. According to Camden County Freeholder Jeff Nash, the county has environmental professionals engaged in additional testing of the lake, and once completed the county will present that information to the EPA and Sherwin-Williams. Nash characterized it as “the most critical environmental” issue in Camden County today, and he also once again called for the lake to be dredged, else it fill in or die completely. However, with Kirkwood Lake belonging to an already established superfund project managed by the EPA, the county cannot dredge the lake without first establishing a legal agreement with the EPA and Sherwin-Williams, so the county does not take over part of the contamination liability that already belongs to Sherwin-Williams. “We are confident that the county will press EPA and Sherwin-Williams to clean up the site immediately and to do it as one project and not to wait to finish downstream before it finishes upstream,” Nash said. To learn more about the Sherwin-Williams/Hilliards Creek Superfund site or the Route 561 Dump Site, visit www.epa.gov/region02/superfund/npl/sherwin.